I wish I had read this when I was a boy, as it's aimed at a younger audience who have most to benefit; however, even at 36 I was able to learn a lot from the simple, innocent and absorbing story of the Marches and Laurences. The book follows four sisters living in New England: Meg, Jo, Beth and Amy, whose father (to begin with) is away helping the Yankees fight the Confederates in the civil war. The lives the young characters lead, though sometimes glamourous or otherwise enviable, didn't cause bitter covetousness in me, but did promote recognition and recall of some of the most treasured moments in my life, and left me feeling optimistic, with raised spirits. 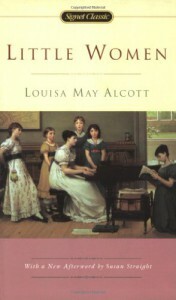 My favourite characters were Jo, Laurie and Amy, and it was very satisfying to recognise some of my own traits and those of my friends and family in virtually every character in the book – clearly a testament to Louisa May Alcott's writing skill. The romantic moments too were very nicely judged, being pleasingly decorous, yet completely convincing at the same time, helped along by the gentle and subtle wit. The humour and pathos that suffuse nearly every chapter deftly leaven the morality tales (don't be put off by that term – although the characters are decidedly pious Christians the book doesn't "moralise" in the overbearing contemporary sense that we all experience, from sniffy lecturing, tutting and unwelcome buttonholing on one side to the ignorant braying of the terminally spoilt on the other). The religious theme, exemplified by fairly frequent allusions to Bunyan's The Pilgrim's Progress and occasional references to God and the Bible, doesn't intrude on the enjoyment of the novel in any way for anyone who knows their own mind and is capable of enjoying a great story well told. Actually, not having read The Pilgrim's Progress (spiritually nonconformist, apparently) was much more annoying (read: just a little bit) than any dissonance involved in reading a 150-year-old novel written in another country. Note that there is no Deus ex machina in evidence – the characters solve their own problems, sometimes with religious inspiration, sometimes without. Towards the end I was listening to Tosca and imagined how it might have sounded if Puccini had written music to describe the book's many touching episodes, like Beth's passing, and Laurie's and Professor Bhaer's proposals (I don't think this would confuse chronology's strict stipulations, but it would require time travel). He wouldn't be able to turn it into a melodrama, but some bars of his very playful and romantic music could perhaps be adapted. Little Women is as sweet and heartfelt as the sweetest parts of La Bohème, but nowhere near as tragic (and, of course, a very different story). A word about the language and literary techniques: descriptive passages are relatively rare, but make a good balance of richness and conciseness when they occur, and are neither impressionistic nor obsessively detailed. I enjoyed looking up the names of many types of fabric, plants and flowers throughout the book – this was a very welcome tactility and sensuousness as an antidote to our world of computer screens, plastic keyboards, and incessant social media status updates. The overall tone is motherly (if I had to describe it one word) but respectful rather than overindulgent or cosseting. The author occasionally breaks the fourth wall, which doesn't jar in the slightest, as some of the more formulaic "Dear reader" asides sometimes can. To compare with film, the use of this device is most similar in feel to The Princess Bride, where the narrator is wise and kindly, and possesses the power of gentle ironic wit. The language is elegant and clear and relatively simple, and might seem somewhat formal to inexperienced readers due to the books age, but one thing it isn't is stuffy and stultifying. There are some dated and archaic words, some of which seem worth bringing back into use, my favourite being "hobbledehoy" (a clumsy or awkward youth). As I got closer to the end of the book, I wondered if the ending was going to be disappointingly sugary. I thought it might be best for the author to stop more or less abruptly, allowing the reader to imagine the rest of the story, because by the time we reach the last 40 pages or so we know that the characters will live happily ever after. Louisa May Alcott didn't leave a cliffhanger, but fortunately the ending doesn't feel too saccharine, happy though it is, thanks to her characteristic gift for humour. This is book one of a trilogy, so there is more of the story for those who decide they want it. For myself, I'm not sure at the moment, having so many other books I want to read, but it's a nice feeling to know that Little Men and Jo's Boys are out there (well, actually, already downloaded for free to my iTunes account), and that they are just as well liked by the people who've gone on to read them.